The Giotto Hotel is situated in the centre of the delightful, old city of Assisi, only 200 metres from the Basilica of St. Francis. 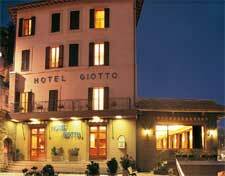 Once a noble residence, since 1899 it has been �Hotel Giotto�. It now has 83 rooms and provides every kind of comfort and services. From its splendid position overlooking the Umbrian valley, for over a century, it has been a preferred destination for even the most exacting of travellers searching for art, elegance and a great tradition.